Who are the biggest fantasy football sleepers and busts for Week 5 of the 2018 NFL season? We use advanced matchup analysis to bring you a list of players who will overperform (sleepers) or underperform (busts) their typical production. Below are some of the top sleepers and busts for Week 5. Fournette is out this week, and the Jaguars play the Chiefs, who have given up the fifth-most fantasy points to opposing quarterbacks. Smith draws the Saints Monday night. New Orleans has given up the second-most fantasy points to opposing quarterbacks on the year and the most fantasy points per dropback (0.70). For comparison, that’s the same amount of fantasy points per dropback scored by Cam Newton (0.70), Jared Goff (0.71), and Ryan Fitzpatrick (0.71) so far this year. Henry has been Tennessee’s lead rushing back, with 54 attempts to Dion Lewis’ 43. The Titans draw the Bills in Week 4, who have given up the third-most fantasy points per touch to enemy backs so far this year. It was an even split between Jones (11 attempts) and Jamaal Williams (11 attempts) in Week 4, but Jones thoroughly outplayed Williams, averaging 5.9 YPC to Williams’ 2.5 while forcing six missed tackles (Williams didn’t force any). Jones also collected a goal-line TD. Up next are the Lions, who have given up a league-high 631 rushing yards to running backs so far this year, including over 175 yards in three of four games. With Fournette out of the lineup in Weeks 2-3, Yeldon produced tail-end RB2 numbers while averaging 6.0 YPC. Last season, Yeldon was also a tail-end RB2 while Fournette was out (with a 7.0 YPC average). 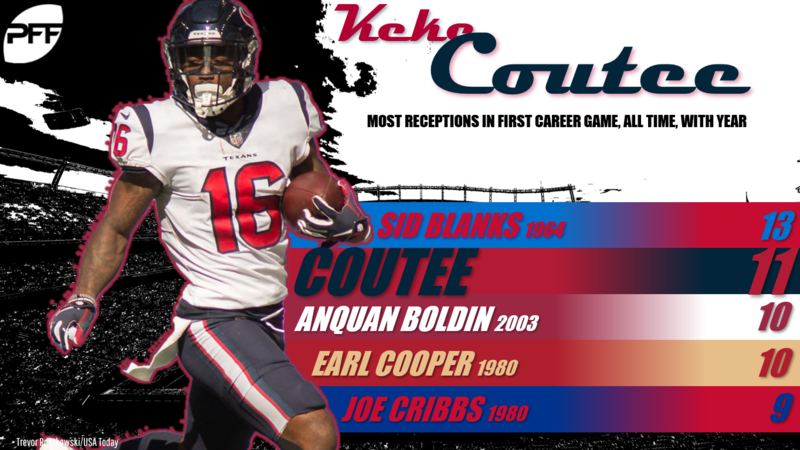 Coutee has his breakout game last week, catching 11 of 14 targets for 109 yards. Coutee draws the Cowboys in Week 4, and fellow slot man Golden Tate just tore the Dallas secondary apart with 8 catches, 132 yards, and two scores. Crowder has been quiet this year, but his breakout week has finally arrived, as he will primarily draw the burnable P.J. Williams in coverage against the Saints. Crowder has the sixth-best individual WR/CB matchup of the week. With all eyes on Julio Jones and Calvin Ridley, Sanu is flying under the radar. But he draws Pittsburgh slot corner Cameron Sutton in coverage this week. Sutton has ceded 12 catches for 210 yards and three scores through four weeks. With C.J. Beathard under center last week, Kittle paced the 49ers in targets (8), receptions (6), yards (125), and touchdowns (1). The Cardinals have given up the sixth-most fantasy points per target to enemy tight ends this year. Mahomes has finished as a top-12 fantasy quarterback every week this year, so it’s hard to bench him, but the matchup is literally as hard as it gets against the Jaguars, who have given up the fewest fantasy points to opposing quarterbacks this year and the third-fewest fantasy points per dropback. Cousins draws the Eagles in Week 5, who have been an up-and-down passing defense this year, holding Matt Ryan to 251 scoreless yards (on 43 attempts) in Week 1 and Andrew Luck to 164 yards and a score (on 41 attempts) in Week 3, while also giving up 402 yards and 4 TDs to Ryan Fitzpatrick and 344 yards and 2 TDs to Marcus Mariota. The common thread: The Eagles stymied passing attacks at home in Philly, which is where this contest takes place. Hyde leads the league in rushing attempts and rushing touchdowns, but his Week 5 tilt against the Ravens is tough, as Baltimore has given up the second-fewest fantasy points to opposing running backs, including just one rushing touchdown ceded on the year. The Jaguars have given up the seventh-fewest fantasy points to opposing running backs and the fifth-fewest fantasy points per touch to the position. No backfield has topped 85 yards — or scored a touchdown — on the Jaguars since Saquon Barkley did it in Week 1 (thanks mostly to a 68-yard touchdown scamper). Ajayi faces a Vikings defense that has held all opposing running backs out of the end zone (on the ground) so far this year. Dating back to the start of 2017, only one running back has topped 100 yards against the Vikings (Jonathan Stewart, Week 14 of last year). Landry’s hype train is riding high, but Baker Mayfield did a great job of spreading the ball around in his debut, with five Browns pass-catchers seeing at least five targets, and six different players finishing with between 34-61 yards. Garcon has one of the toughest individual matchups of the week against Patrick Peterson (even though we don’t expect a full shadow situation). Garcon did see the second-most targets last week with Beathard under center — which is good news for Garcon’s rest-of-season outlook — but this is an obvious downgrade against one of the best corners in the league. The Eagles have given up the fifth-fewest fantasy points to opposing tight ends this year, and excluding a 75-yard touchdown given up to O.J. Howard in Week 2, the Eagles have given up just 85 yards to opposing tight ends through four weeks. The Titans have given up the fourth-fewest fantasy points per target to opposing tight ends this year, while Clay remains in a four-way battle for targets in Buffalo with Clay, Kelvin Benjamin, Andre Holmes, and Zay Jones all seeing even work with Josh Allen under center.